Home > Multi Edit Software Incorporated. Found 4 file extension associations related to Multi-Edit and 3 file formats developed specifically for use with Multi-Edit. Developer: Multi Edit Software Incorporated. Multi-Edit implements solutions as fast as you can think them. It is a powerful IDE, with its speed, depth, uncompromising access, and support for over 50 languages. Think it, build it, keep it in line. A top tier program editor, ME provides a single environment in which you can control all your VCS programs and compilers, and at the same time integrate with your existing RAD environment. Never cut-and-paste your code between editors again. Have access to language reference guides as close as your right mouse button. With the addition of BCDiffer, by Scooter Software, ME received a boost to its file compare utility. ME also includes the Evolve XBase AddOn and Polystyle code formatter. MEs enhanced search function includes Perl 5 and UNIX Regular Expression support and new definable Search Filters. ME has one of the most configurable and fastest search and replace engines. Search across multiple files, folders, directories, and drives. Define the perfect parameter with regular expression support. Find text as you type incrementally. Once your text is found, its highlighted throughout the entire file. 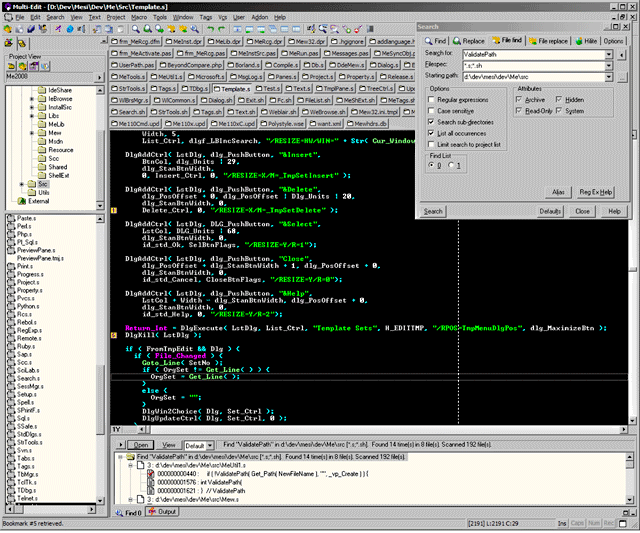 File Sync Integration for: Delphi 6, 7, 2005, C++Builder 6, BDS 2006 and RadStudio 2007, VB 6, VC 6, VS 2003 & VS 2005. Seamless integration with TopStyle, CSE Validator, HTML Tidy, Beyond Compare, and more. ME supports large DOS/Windows, UNIX, binary and Macintosh files. With ME2k8 your keyboard mappings and menus are fully customizable. Change fonts, colors, screen layout, and toolbar's, from one easy interface. Most dialogs are also resizable. ME enlists a bookmark feature to help ease the transition between editing positions in a file. Jump back and forth between different positions effortlessly with the Bookmark feature. Collapse code that you do not need to review, to further speed up your file browsing. Collapse tags and functions (This feature is dependent on the programming language, see our complete feature listing for more details). Start programming better and faster today with ME. If you need more information please contact the developers of Multi-Edit (Multi Edit Software Incorporated. ), or check out their product website.